Travellers over 65 are being left high and dry by many insurers refusing to cover them and by steep premiums on policies they are offered, according to Which? A study by the consumer group found that a quarter of insurers do not provide annual over 65 travel insurance, while nine in 10 do not cover people aged over 80. Out of the 85 insurance companies assessed, 86% had a maximum age limit for single trip travel insurance. Just over a quarter (29%) of firms provided a single trip quote for travellers in their 80s. Once they reach their 65th birthday, older people who do get travel insurance can face a three-fold rise in premiums, the group said. Which? executive director Richard Lloyd stated: "It's absurd that you could wake up one morning and suddenly be three times more expensive to insure. 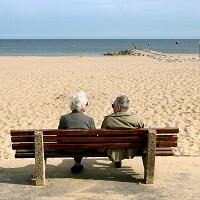 "Older travellers are finding it increasingly difficult to get cover or are priced out of travelling altogether. "Insurers should take a more common sense approach and look at factors other than age when setting premiums." Which? has backed rule changes aimed at preventing travel insurance premiums for older people from being hiked simply because it is assumed they are more likely to suffer illness or accidents while abroad. Under the Government proposals, insurers will be required to furnish evidence to justify the higher charges.